St James has a pipe organ and a small choir of mixed voices who lead the regular Sunday worship. Our main hymn book is Common Praise (2005) , but we occasionally also use Ancient & Modern Revised, One Hundred Hymns for Today and Songs for Worship. We usually use Anglican Chants for the Psalms and Canticles; Merbecke for the Scottish Prayer Book services and more modern music for 1982 Scottish Liturgy services. We sing occasional anthems and hold a special Carol Service during Advent. Anyone who can read music and sing a part and is interested in joining the choir (choir practice takes place fortnightly on a Friday evening) should speak to our Assistant Priest Revd Canon Ruth Edwards, who can be contacted in church after our Sunday morning service. 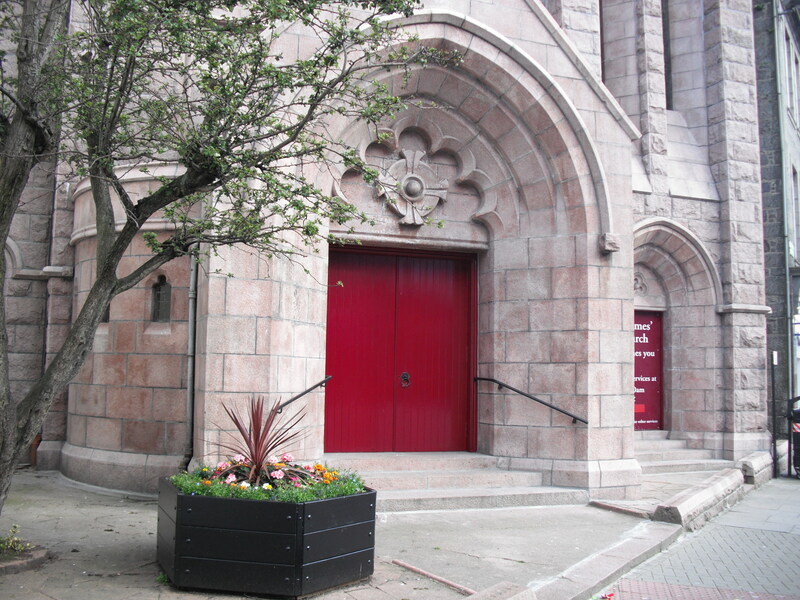 The organ was purchased in 1884 (for £225) and moved from the Crown Street church. It was originally installed on the north side of the chancel and was transferred to its present position when the south aisle was added. This move gave access from the chancel to the Vestry. As there were always problems in obtaining the services of a reliable ‘boy’ to blow or pump the organ, the problem was overcome by the purchase of an electric blowing apparatus in 1897 for £5. The organ has been rewired and repaired many times over the years and is tuned annually. Over the years the church treasurers may have thought back with some longing to the time when the church purchased a second hand harmonium for £33 in 1855, the year of the Crimean War! The east window was installed in 1901. This is one of Douglas Strachan’s early masterpieces. It represents Christ in glory, adored by angels; the law and the prophets, represented by Moses and Isaiah; then the evangelists, St Matthew the man, St Mark with a lion, St Luke with an ox and St John with an eagle. The west windows were given in 1940 by Mr J F Kay, in memory of his wife. Unfortunately the small one at the end of the north aisle, a gem of Douglas Strachan, was vandalised some years ago and although the pieces were retrieved, restoration was not possible. The big west rose window is the work of John M Aiken. It is beautifully coloured, representing the Virtues, with Charity as the central figure, the outer right clockwise from the top, being Purity, Humility, Temperance, Mercy, Peace, Hope, Faith and Truth. The lancet window in the north wall of the chancel,is the most interesting of all the windows historically. It was gifted by Colonel Lumsden in memory of his son, Lieutenant William Henry Lumsden who was killed in action at Nujuffghur on 25th August 1857 during the Indian Mutiny. He was serving in the forces of the East India Company in a regiment of which he was part founder, the ‘Guides’ called the Eyes and Ears of the Military.